I spent a whole day with the 1980’s today. I’m in the show “Steel Magnolias” which takes place during that decade, and then tonight I went to see Cheap Trick and Blondie in concert. Talk about a blast (or two) from the past! As a child of that decade (I graduated high school in the mid-80’s) days like today take me right back to my teenage years. I remember the music, television, fashion, and of course, the FOOD! 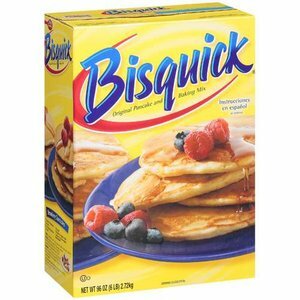 The play references a LOT of food, including a recipe that contains Bisquick “which makes it SO easy!” I remember my mom making recipes with Bisquick, including “Impossible Cheeseburger Pie” and a few others. That got me to thinking, what foods do YOU identify with from your childhood? My dad was the pizza king. Every couple of weeks, we’d have a pizza night, where Daddy would make up the crusts from the Chef Boyardee pizza kit, and us kids would get to help him put toppings on it. He was never content to just put that little can of Parmesan cheese on those pizzas. Instead we had provolone, mozzarella, cheddar, even American cheese some weeks! Mom also made a chicken and stuffing casserole that was a family favorite. My brother and I ate PB&J on white Wonder Bread, and we actually put Utz potato chips INSIDE our sandwich to make it crunch. My mom also would make us Steak-Umm sandwiches, with American cheese and mayo. They were great at home, not so great for school when they tended to get cold. It amazes me how closely linked my memories are to food. I guess I was feeding way more than my stomach back then! What did YOU eat as a kid? Are there any foods that when you taste them take you back in time? Please share!